D is the inactive position. With the engine running, mirror deicing is activated simultaneously with rear screen de-icing/demisting. 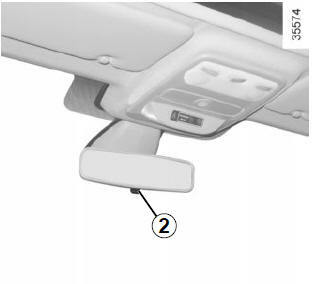 Move button 1 to position F: the door mirrors fold away. 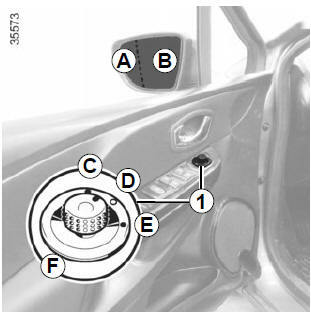 To reset them for driving, return to position C, D or E.
The driver’s door mirror may have two clearly defined zones. Zone B shows what can normally be seen in an ordinary rear view mirror. Zone A increases rear side visibility. Objects in zone A look much further away than they really are. Its position can be adjusted. For night driving, to avoid being dazzled by the headlights of the car behind you, flip the small lever 2 located behind the rear view mirror. The rear view mirror darkens automatically at night if you are being followed by a vehicle with its lights on.